By Walker & Hall. EPNS 'silver' label in an elongated octagaon shape approximately 5 x 2.5cm. Slightly concave shaping with raised ridged border. Fitted with a chain to hang around the neck of a glass decanter or bottle. Engraved to centre with King's crown R.A.F. 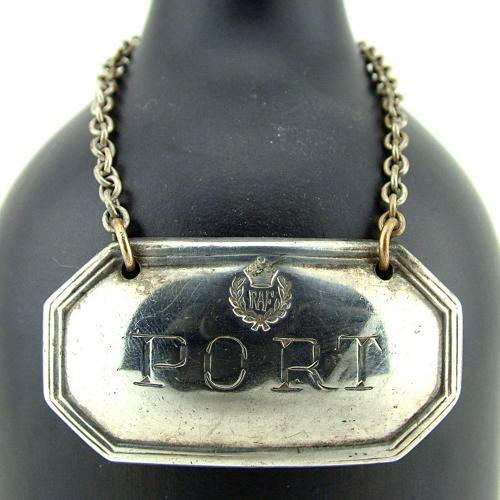 crest and 'PORT'. These labels were used to distinguish the various spirits within the officers' mess. Manufacturer's marks to rear. Would benefit from a quick polish but in very good used condition. Stock code M22773.